The Historic Centre of Sighisoara is a well preserved small medieval city built by Saxon settlers. It was strategically placed on a hill, City Hill, as protection against Tatars and other invaders from the steppes in the East. The city played an important commercial role due to its guilds of craftsmen and its position on the trade routes between Central Europe and the Ottoman Empire. It is estimated that during the 16th and the 17th centuries Sighisoara had as many as 15 guilds and 20 handicraft branches. Both the Upper Town (Citadel) and Lower Town are included. The Citadel is surrounded by a wall with watchtowers, of which 9 out of the original 14 are still standing. A Clock Tower guards the stairway that connects the Lower with the Upper Town. 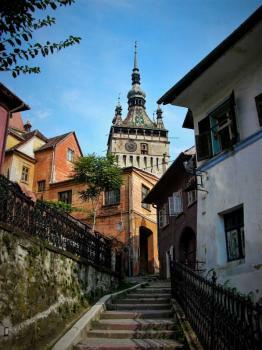 The author of the Bradt Guide for Transylvania goes on and on in her praise for Sighisoara: “… like taking a trip back in time, to an era crowded with vampires, evil counts, wolves, peasants riding through the untamed countryside on horse-drawn carts and tipsy old men tottering along the narrow, winding streets”. After having visited the site myself, my conclusion is that she must have been living under a stone all her life, or just spent too many years in Romania. It’s a nice town to visit for half a day, but is it any better than similar medieval city WHS? San Marino (much bigger and more spectacular location), Assisi or Toledo (both more impressive individual structures) come to my mind. Only these cities were not on the route between Central Europe and the Ottoman Empire… (a regional aspect is what distinguishes it the most). What I liked best of Sighisoara was the long covered wooden staircase that leads up to the very top of the hill. It was built to cover schoolchildren and churchgoers from the rain. It reminded me of a similar one at Biertan Church that I visited earlier that day. Later on, during the Mongol Invasion (mid 13th century), many Transylvanian towns were fortified in order to be protected. Seven of the main fortified cities were particularly important and, because of these seven city, Transylvania was called Siebenbürgen in German or Septem Castra in Latin, that literally mean Seven Fortresses. Sighișoara was one of them and played an important role, both military and commercial, in the border region between central and south-eastern Europe. The Historic Centre of Sighișoara is inscribed in the UNESCO World Heritage list since 1999. 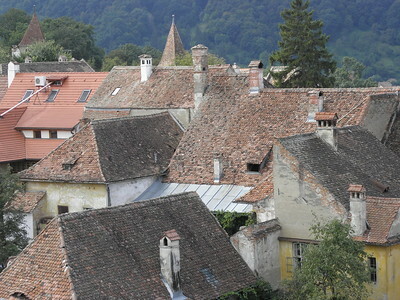 The city can be reached easily from any major city in Transylvania by bus or train. I personally went to Sighișoara on a day trip by train from Brașov. The best way to visit the historic centre of Sighișoara is on foot. The citadel is small and with good weather it is very pleasant to walk along the narrow streets and stop at one of the many cafés for a drink. The citadel is in incredible conditions. It looks and feels as if it still is a medieval town, except for the few cars parked here and there. At the end of one of the main roads there a stairway, completely covered with a wooden structure, that leads to the Biserica din Deal (literally Church on the hill). The church, one of the most important of Transylvania, dominates the city from the hill and it’s visible from every direction, even from far away. Another church is the 13th century Biserica Mânăstirii Dominicane, the Monastery Church, which is interesting for the fact that it doesn’t have a bell. It is believed that the Saxons considered the bell of the Church on the Hill enough for the entire city so they didn’t place one on this other church. The most recognizable landmark of Sighișoara is the Turnul cu Ceas, the Clock Tower. It’s the main entry point of the citadel and with its size it dominates the whole city. The are also several other towers still standing around the citadel, named after different important medieval crafts. 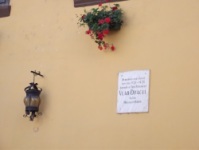 Another curious fact is that Sighișoara is the birthplace of the (in)famous Vlad III the Impaler, better known as Vlad Drăculea or Vlad Dracula, the historical figure who inspired the character of the vampire Count Dracula in Bram Stoker’s novel Dracula. The inhabited citadel of Sighișoara is the best preserved example of the architecture and culture of the Transylvanian Saxons. Its 850-year history is now coming to an end and the cultural heritage is threatened by the constant emigration of the Saxons toward Germany, where they are still considered citizens. In 2011 the German population was only about 1.5% of the total population of the city. Therefore Sighișoara will remain the only testimony of that particular culture in Transylvania and, thanks to World Heritage List, it will be preserved for the future generations. Read more from Riccardo Quaranta here. The citadel of Sighisoara compares well with other medieval hilltop towns. Surrounded by defensive walls and towers its colourful streets and squares are full of interest. The covered bridge to the summit is of interest, but the views from the pathway were spectacular. The town's association with Vlad Dracul (Vlad the Impaler) is another drawcard. Sighisoara is a great little town, best not necessarily for the sights but for just feeling that small town, rural atmosphere cranked a couple of centuries back (especially if you also find your way in the areas around it). It may not be as monumental or as impressive as San Marino, but in terms of real life San Marino has long died and gone to heaven. At least locals still go in the Sighisoara citadel on weekends to have fun. I was really dissapointed to read João Leitão's reviw to Sighisoara. It is a place that means more than the dirty trainstation, the gilrs trying to eran their existance and jipsies selling girls. Too bad he did not get to feel as in another world, in another time when walking on the narrow and incredibly beautiful stone paves streets, dating back the 16th-17th century, he did not enjoy sun on the mural paintings on the Clock Tower, too bad he didn't get to know the real history of the citadel,and why not, feel TRue Sighisoara, in fact true Romania is behind all these bad sights. But it's not hard to get over them, and it's defenetly worth it. Sighisoara is one of the most beautiful palces I have ever seen, and i can say i have seen plenty. So, if you have the chance, don't miss visiting Romania. you know what they say: "romania, always surprising"
first time i got out in sighisoara train station i had a guy that frightned me a lot that actually made me go into the train again and forget about my visit to this wonderful city. i don't quit that easily so i went there again. no prob. it's a wonderful city with really nice people. train station is not near the city center, walking relaxed it would take 20 minutes. the wonderful tower with the sighsoara museum is just great. on top panoramic view of the city can be seen. small iron plates are stuck on top of the towers balcone with letters saying how many km are world capital far from there. interesting. vlad draculs house also can be seen. he lived there for a couple of years. restaurants are cheap. i'm vegetarian and had no problems with that actually. instead of going in the normal turist road to the castle top, just try to climb the hill, jump over bushes and castle walls. much better cos you'll always have citys panorama on your back. by the other way (the bridge way) you'l not see this. also a good thing to do is to go to the hills the other side of the citys palace and tower and enjoy the view of the old city of sighisoara instead of the new (or at least relatively new one) part. don't be scared of the neighborhood. pople are poor and don't look that nice. but just keep on going and smile. they are not going to bit your neck or anything. after the new church (orthodox) and the bridje theres a small store selling fresh oven cookies (they are freezed ones, but ver nice). pity of the girls they work there: they work 16 hours a day 7 days a week for a monthly wage of 90 euros. incredible but true. in the center town i tried to change some money after banks closed. i somehow took from the atm machine 1,000,000 leo, instead of 100,000. last day in the country and had no need of that money and couldn't also changed it in hungary. remember romanian leo is not good out side the country and can't excanche it anywhere. just know one place (main train station in budapest). like i was saying i tryed to change some money, i talked with a taxi driver that took me to a hotel to speak with a jipsy guy. he wanted me to go inside a room with a very young girl...pity pity. i end up exchanging some money with an australian guy that was going to stay there for some days...good luck and enjoy a hard country but very nice!! 165 Community Members have visited.